In Austria only the upper slopes on the Kitzsteinhorn Glacier are open with the snow cover still thin and temperature at 3 degrees Celcius, sleety snow is expected over the next few days. The Dachstein glacier has limited skiing and describes its 60cm base as ‘wet.' On the Molltal glacier it's not been great either, with runs closed on Tuesday as rain fell, but this should turn to snow when temperatures drop below the current 4 degrees on the glacier and the 9.5km of summer runs should re-open and much of the 1.5m (five foot) base should remain intact. Hintertux too has seen a mixture of fresh snow (5cm) ad rain. It's base depth stands at 125cm (just over four feet) with nearly 700m of vertical still skiable at the year-round snow sports resort. 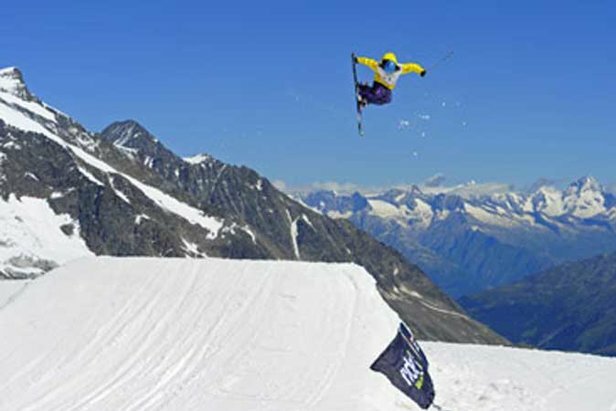 In France Tignes and Les 2 Alpes are still open with similar conditions to Austria, if a little less precipitation. Snow depths are 60-100cm (2-3.3 feet). It's likely to be warm today (Wednesday), but cooler tomorrow down to -5 on the glacier with precipitation forecast that will hopefully fall as snow for the last few weeks of the summer ski season. In Italy Val Senales received 5cm of fresh snow last week and has a one metre base and 8km of piste open. It's a similar picture at Passo Stelvio and Cervinia, the other two Italian areas currently open. The other two open glaciers are in Switzerland, neighbouring Saas Fee and Zermatt. Saas Fee has some of the best conditions in Europe right now with temperatures on the glacier around freezing, 8cm of fresh snow last Friday, four runs, the glacier half pipe and the terrain park open and a 126cm (over four foot) base.